Three weeks in and I can’t quite understand where the time has gone. Seriously, I feel like a day went missing this week. Monday and Tuesday were spent listening to Professor Neil Piller, of Flinders University, talking about some of the conditions that can be treated with manual lymphatic drainage; some of the tests that can be run to see how the lymphatic system is working, which pathways the lymph is using; some of the equipment we can have in our clinics to help us tell what is going on with our clients’ bodies; some of the equipment we can use to help in our treatments; more anatomy and yet more physiology. I think my brain is going to explode. On Wednesday we had our first class with Koby Blanchfield, an accredited practical instructor with the Vodder School. 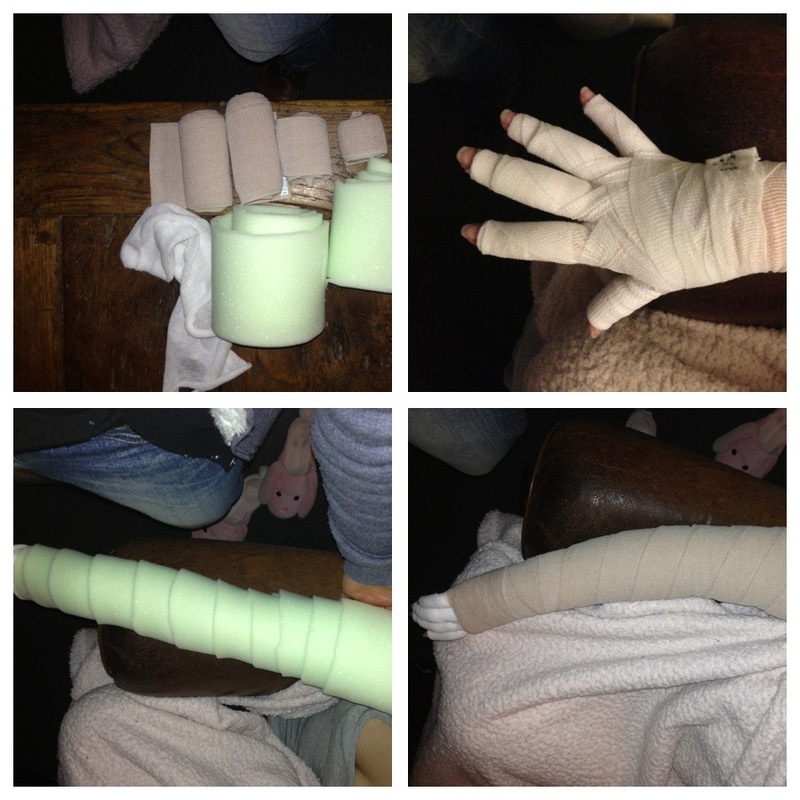 This week it’s all been about treating conditions and bandaging. The only interruption to the practical work this week was another theory exam on Thursday morning on everything Prof Piller taught us. Glad to be done with that one. Here’s a photo of my poor daughter, bandaged up while watching TV on Thursday night. My kids are very patient with me thank goodness. Bandaging my daughter for homework – please note the adorable pink bunny slippers in the background! How cute are they? This weekend’s homework is more bandaging, studying all our basic treatments as well as all the “specials” in preparation for more scenarios next week. Maybe I can allow myself a sleep-in on Sunday! I think your head is ready to burst!!! I think it may have already!